Hello, my name is VADIM KOLPAKOV, I'm a professional musician and have been performing on professional stage since my teenage. I'm not using much the GigMasters website but you can always Google my name or visit my website to see more information about me. I provide acoustic guitar music entertainment for any private or corporate event as well as performing nationally and internationally at concerts, festivals etc.... If you are looking for the best quality music entertainment, you can contact me directly. I travel to any destination in North America and overseas to almost any occasion. International class, world virtuoso music. Acoustic-classical-Spanish-fusion guitar. - Selected covers arranged for a guitar. ABOUT VADIM: A local gem with a unique sound that wins the hearts of everyone – young and old. His music is romantic, beautiful, lyrical, passionate, fascinating and always captivating. It will make your event very special and unforgettable! 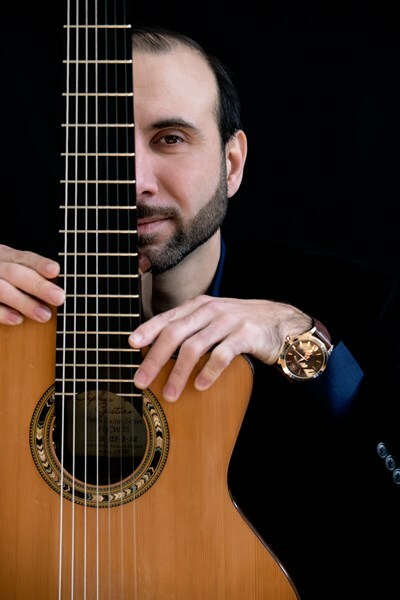 His art rooted in Gypsy tradition, and enriched by Flamenco, Jazz and Latin cultures, enchant audiences with intricate improvisations, spell binding rhythms, and beautiful melodies. Vadim can perform as a soloist or with his band, duo or trio, as desired. Vadim's Kolpakov virtuosity have impressed the pop icon Madonna so much that she invited him to join her on the 2008-2009 Sticky and Sweet World tour. 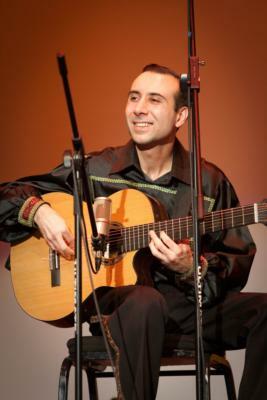 Vadim Kolpakov is a virtuoso seven-string guitarist, dancer and vocalist. A graduate of the Romany performing arts school Gilori, he studied guitar with his uncle and mentor Alexander Kolpakov in Moscow. At the age of 15, Vadim joined the Moscow Romen Theater as a guitarist, vocalist, dancer and dramatic actor. Since then, Vadim has performed extensively in Russia and abroad; he has given concerts in Carnegie Hall (New York City) as well as in the Kremlin (Moscow). He has participated in numerous musical projects on Russian, European, Canadian, and American television and radio. He was an artist-in-residence at the University of North Carolina at Charlotte in 2006-2007. In 2008-2009, Vadim Kolpakov went on tour with Madonna as a performer in her Sticky and Sweet World tour. In addition to being the founder of the band Via Romen, Vadim performs in the guitar duo Zingaresca and as a special guest with various U.S. artists and bands. 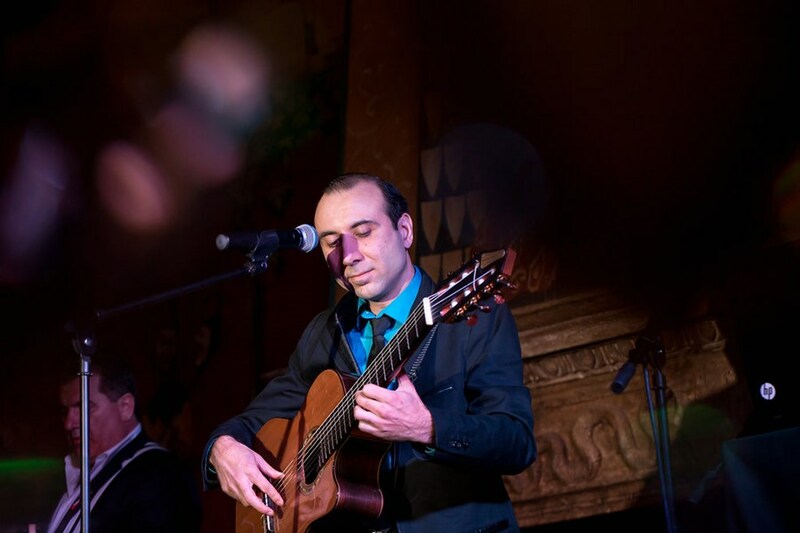 His musical repertoire includes Russian- and Romany-style compositions by Alexander Kolpakov, 19th-century Russian seven-string guitar repertoire, Spanish flamenco, Pop music, Jazz and his own compositions and interpretations on classical, rap and world music. * Percussionist, professional Latin/Flamenco dancers, singers, violinist, accordion player and other musicians to compliment Vadim Kolpakov are available upon requests. Vadim Kolpakov (or ensemble, as desired) can perform in many settings including: Private parties, small intimate club dates, fine restaurants, weddings, as well as festivals, college programs, receptions, corporate events, classical events/symphonies – and delightfully entertaining, large stage productions. "Vadim Kolpakov is a genius guitarist, singer and dancer, who is producing on stage a fantastic music palette of colors" - Rada Volshaninova, Russian super-star singer. "I love this music, listen to it in a car every day!" – Inna Wilson. I would be happy to help you plan your special performance needs and provide the best music entertainment at your event! Vadim was great! Super fun and flexible during my event, stopping when we asked and providing great entertainment for guests of the dinner. Vadim was great with communication from the very moment that I booked him for our private event! He kept in touch through to the date of the event and showed up right on time ready to go. His talent is amazing and we were thrilled to have him playing to our group for our themed event. We would definitely repeat in the future and would strongly recommend him for others. Great performance! Really enjoyed the music and the musician. Thank you very much, Tracey! Glad that you enjoyed the evening with my musical input! Vadim is incredibly talented. He was easy to work with in terms of dates and times. Vadim also is just a great person. So kind and happy. A pleasure to work with. Vadim is a very talented guitarist, the music was lovely. He was professional, respectful, and always happy to accommodate our special requests. I highly recommend him. He was performing with fellow musician Alex Gorodetsky (Via Romen duo) as background music at a memorial dinner, a strange venue for a jazz guitarist. They handled it gracefully and played beautifully, working together to create the atmosphere we wanted. I would hire them again in a heartbeat. Please note Vadim Kolpakov will also travel to Pineville, Matthews, Fort Mill, Indian Trail, Waxhaw, Monroe, Paw Creek, Rock Hill, Catawba, Bowling Green, Belmont, Gastonia, Cramerton, Harrisburg, Midland, Mc Adenville, Clover, Edgemoor, High Shoals, Lowell, Mount Holly, Newell, Wingate, Cornelius, Lancaster, Stanfield, Huntersville, Lincolnton, Marshville, Mount Mourne.